In 2009 I needed surgery to remove several fibroid tumors from my uterus. The largest tumor was 13.5 centimeters, "the size of a baby's head" my doctor told me. The surgeon was very confident he could snip them all out. He said "I have been doing this surgery for 35 years and I've never had an unscheduled hysterectomy"
I woke up after 4 hours in surgery to my doctor telling me they had taken out my uterus in order to stop the excessive bleeding. Three months later my sister had the same surgery in China, where she lives. 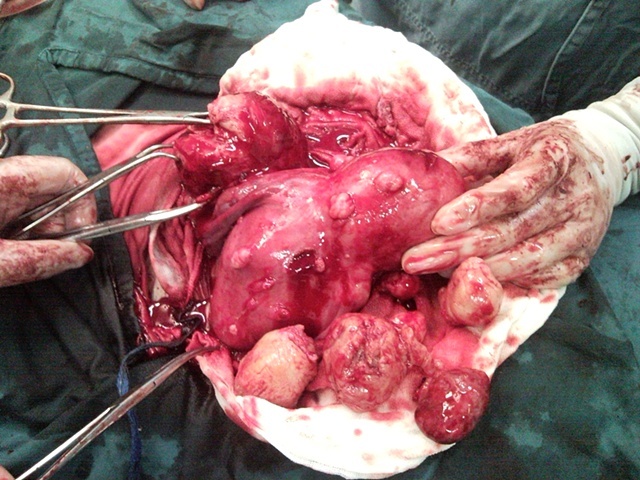 They took out 13 tumors and saved her uterus. This picture is from her surgery.